Diagnosis of bronchiectasis has increased with broader availability of high-resolution CT scanning. Early diagnosis and development of a patient-specific exercise and airway clearance regimen and a pathogen eradication and suppression plan are key to successful treatment. Management can be shared by GPs in co-operation with a specialist respiratory physician and respiratory physiotherapist. Underdiagnosis of bronchiectasis has been a significant problem caused in part by clouding by coexisting respiratory comorbidities including chronic obstructive pulmonary disease and asthma. High-resolution CT scanning is now widely available and is the gold standard diagnostic test. Confirming a diagnosis of bronchiectasis enables the provision of disease-appropriate treatments and the rationalisation of potentially inappropriate treatments. Exercise, airway clearance and mucoactive therapies all help reduce airway inflammatory burden, leading to reduced symptoms and exacerbations and improved quality of life. Microbiological surveillance enables the identification of agents such as Pseudomonas aeruginosa and nontuberculous mycobacteria that have powerful negative impacts on symptoms, lung function, exacerbations and healthcare utilisation. Antibiotics play a key role in the eradication of novel microbial isolates, immunomodulation, exacerbation management and long-term suppression of microbial colonisation in the airways. GPs can share in tailoring a patient-specific management plan in co-operation with a specialist respiratory physician and respiratory physiotherapist. 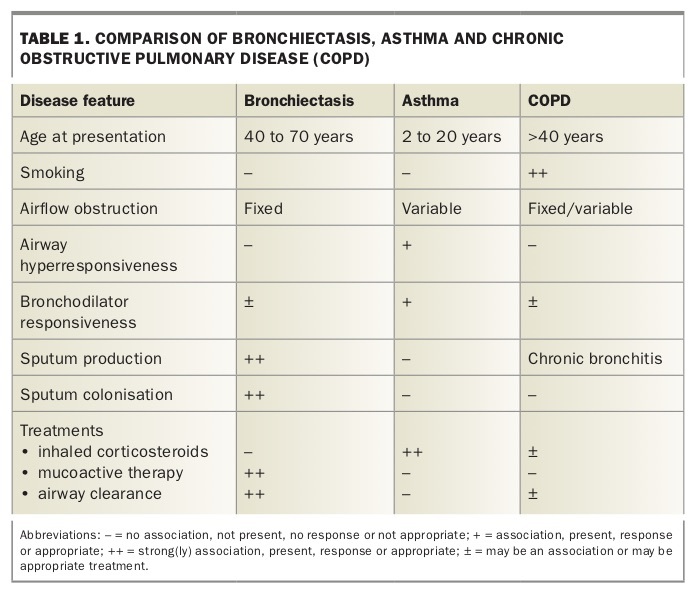 Bronchiectasis shares many symptoms in common with other respiratory conditions including chronic obstructive pulmonary disease (COPD), bronchitis and asthma (Table 1) and the risk of underdiagnosis may persist if the diagnosis is not considered and radiologically confirmed. Bronchiectasis can be defined simply as a permanent dilatation of the airways, arising from chronic bronchial inflammation and infection.1 Before high-resolution CT scanning became broadly available, infection may have been apparent to a diagnosing clinician but pathological bronchial dilatation was difficult to confirm, meaning that this condition remained largely underdiagnosed. When misdiagnosis persists, patients with bronchiectasis tend to be regarded as having ‘difficult’ or treatment-resistant asthma or COPD. As such, they are often, sometimes mistakenly, treated with increased doses of inhaled corticosteroids and bronchodilators, and do not receive the physiotherapy, mucoactive therapy and antibiotics that are appropriate for treating bronchiectasis.